What should the force curve on the Skierg look like? I haven't come across information on what the force curve should be. I'm still improving my technique on every pull, and I can see it in the force curve. When I do the correct sequence and pull smoothly trough the stroke I get the best time and the smoothest curve. It looks similar for hard intervals, only with a higher peak and a bit shorter. Would be nice to read something like this, but for SkiErg. Does anybody know if there's some (free available) information out there? Do you know any Scandinavian language? I bet they could tell us something interesting about using this machine. After a lot of trawling (in English) I gave up searching for this type of information. Looking at that picture in my earlier post, that force curve looks wimpy. I've improved the shape and smoothness a lot over the past 1Mm. If only I could do the same with force production. Balkan boy wrote: Do you know any Scandinavian language? Figure 3 shows a very similar shape as per rowing (my curve shape was not too dissimilar: similar to Balkan boy's photo above). Figure 5 shows the trunk and legs produced more power in the first half of the drive, then the arms in the second half. That's a very front-loaded curve with a long tail. I wonder if Justin is using his lats/arms very early in the sequence compared to the Biorow tests? I'm new to the SkiErg... I was wondering about this because I don't want to start with bad form. I'm on FB only for rowing and, now, skierg. I'm in a skierg group. I'll ask them. Don,t think rower and skier are much alike, rower for me has more peakforce and is steeper, skierg is very frontlaoded with a long tail. Re squat skierg, hardly squat at all, its all hiphinge for me. And still find it hard to go fast. Other thing is recovery, skierg is easier on this, the rower digs deeper in your overall reserves. Think its because we do recrute the bigger muscle more. Paul Jeffrey on the skierg. Has a different technique. Pulls 1.04 lowpull and can rate very high this way, hardly any hiphinge. Pulls only vertical. 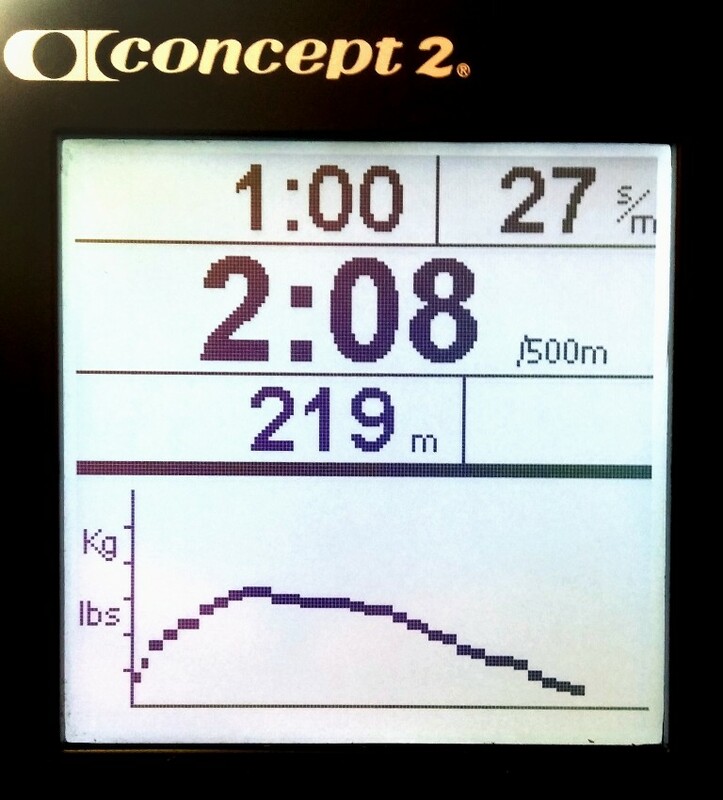 Wr sprint, in the 50 plus cath, both on the rower and skierg. Yes he is big, but still there are more big guys, nobody touches him..
Dadgum... that's insane. I got winded watching him. Me too Guy is a beast. Powerfull. The Biorow photo is not a good form for the Skierg, for one thing because the guy has his eyes fixated on the monitor instead of focusing on the movement. Justin Farina is fast and has a few records; however he lifts back up with his torso while still pushing down with his arms, which is quite inefficient. He would likely be faster and more enduring with better coordination between them. Here's a clip of Kate Hilliard doing her women's 2k world record, and a clip of Paul Jeffrey doing a 100m record for the 50 to 59 age group. He has a good form, but he's stifling his air supply with all the noise that he makes, which would limit him greatly over longer distances. Notice both Hilliard and Jeffrey have a full coordinated movement all the way through, albeit at different speeds and paces. Also Johan Olsson on skis. I like Kate Hiliard's (and Olsson's) form the best, and try to emulate it, but don't reach that high, and my cords aren't long enough to go any lower. I already hit the bottom of them every stroke, which is barely below my knees. If I ever get another set, I'll try to get longer ones.